This elegant river cruiser has been cleverly versatility, quality and style. Featuring an upper helm affording excellent views with ample seating and a table, the Sheerline 900 Sunbridge enables the owners to take advantage of fine weather, while the lower forward helm permits all weather cruising in comfort. The innovative use of space means that this boat sleeps 4 to 5 people. The interior has a seperate aft cabin with a double bed, wardrobe and dressing table. 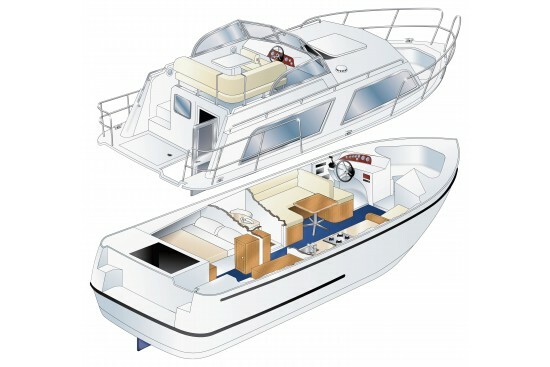 And the wheelhouse saloon forward of the galley and shower and toilet compartment has a U-shaped dinette converting to a double berth and a two seater settee unit that converts to a single berth.